"Republican presidential hopeful and former Arkansas Gov. Mike Huckabee speaks during a rally at the University of Maryland in College Park, Md., Saturday, Feb. 9, 2008." I got the opportunity Saturday afternoon to shoot Republican presidential hopeful and former Arkansas Gov. Mike Huckabee at the University of Maryland in College Park, Md. With Maryland primary elections on Tuesday, all the hopeful candidates are making appearances for speeches or rallies. I’ve only shot gubernatorial elections when it comes to politics, so I had a blast. Sure, he can't mathematically win because he can't get enough delegates to support him, but that hasn't hindered the campaign. I mean, he could still win, but it's just very unlikely. It was also known the crowd and media wouldn't be as massive as say the Clinton or Obama rallies, but we still arrived about two hours early. To burn time, I walked around College Park, the university that never responded to my application whether or not I got in. After walking for only 10 minutes, I realized the campus was not only monstrous, but way better than Towson in many aspects. Too bad I am graduating sometime this year or I'd transfer. Anyways, around noon the ball room where the rally was being held starting filling up. I would estimate around 500 people squished into the alloted area. This event was very fun to shoot, although more or less a speech, the action of the crowd and Huckabee had me darting back and forth in front of the stage constantly. 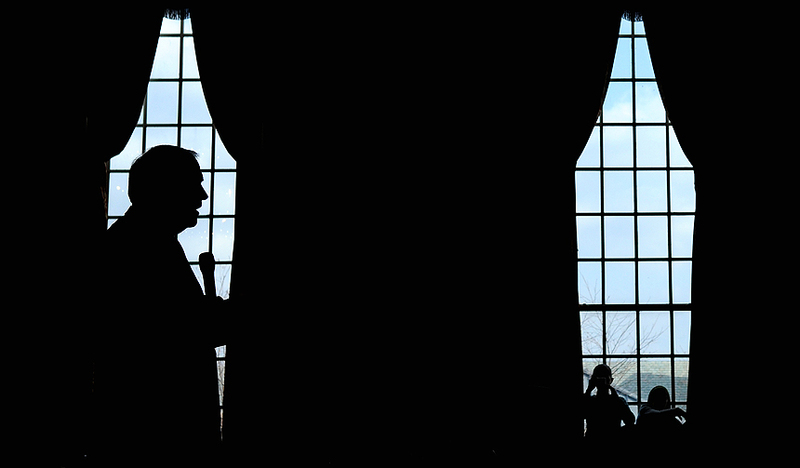 About halfway through the speech, I stopped shooting and took a peek of my surroundings. Although there is only so much you can work with during an event like this, I saw many different angles and images. I would love to comment more on this event and my day, but this week has been non-stop shooting. I promise to update this post with more images, but this lack of sleep is beginning to take a toll on me physically. I need some shut eye. Until tomorrow, check out my ten favorite images from the rally on my Sports Shooter page.